Last edited by shogun; 04-23-2018 at 01:54 AM. Last edited by shogun; 08-21-2013 at 07:48 PM. Yesterday I went to the bi-annual inspection to get a new roadworthy sticker. While the inspection was no problem and I got my new sticker after paying road/weight tax, suddenly the blower fan started to run only on full speed and even was running on full speed when I switched off the blower fan complete on the IHKA control panel. When I came back home I removed the sword and connected another repaired one on the wire loom without installing it and that worked fine, installed it and blower fan works fine in all speeds. Best is to use BUZ11, they can stand more than the original ones. 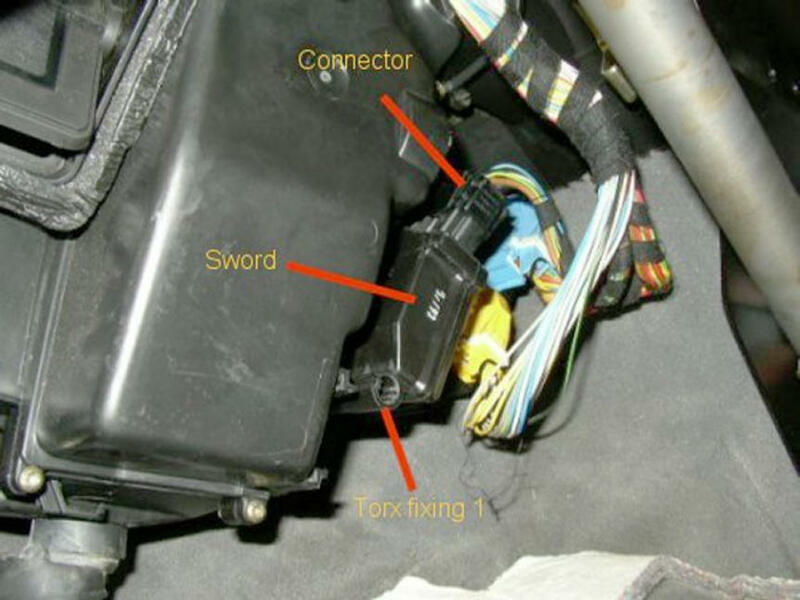 In case the fan now only switches off while switching off the ignition, then one or several of the MOSFET's in the sword are defective and give permanent signal to run.This has nothing to do with the relay in the sword handle. This relay only activates at "max fan speed" adjustment respect. defects. The BUZ 74 have 12A and 40 Watt, the BUZ11 have 25-30A and 75 Watt! To cover the soldered items and protect them against moisture and damages, they either use UHU hard (if you have that in the U.S.), that is a glue which dries quickly,suitable for flexible material and all materials, moisture resistant and heat resistant from -50 to 100 degree celsius. Or any other glue to protect the soldered items. Or a 2-component glue, if you want to make it faster to dry. It should seal all to protect against moisture, that is the most important. And of course it must be resitant against certain temperatures as mentioned above. So any all purpose glue will do probably. Inside the Sword case you will see 3 capacitors marked 3.3 uF/50V. They are C1, C4, C5. You can buy Panasonic EEU-EB1H3R3S capacitors from DigiKey.be for E 0,23 each. They are polarized, so there is a + on the board. One terminal of the lamp goes to pin 5. The other terminal of the lamp goes to 12V. Ergaenzung: Heizschwert- Geblaese geht nicht aus. Nach dem hier nun oefters die Frage gestellt wurde, warum das Geblaese nicht ausgeht, obwohl der Schalter auf "0" steht, hier nun des Raetsels Loesung: Es ist der Leistungs-FET. Er ist durchgeschlagen, d. h. hat einen Kurzschluss. Test: In der Stellung "MAX" laeuft das Geblaese geringfuegig schneller als in dem Regelbereich. Das liegt an dem Relais, welches bei "MAX" die FETs brueckt. Um den defekten FET zu finden, muessen alle FETs ausgeloetet werden und wie in dem Anhang gezeigt, getestet werden. Mit zwei Fingern abwechselnd 1 und 2 (AN) und 1 und 3 (AUS) beruehrt werden. Es handelt sich um BUZ71, BUZ11 kann ebenso verwendet werden. Also auch diese Fehlervariante kann am Heizschwert auftreten. It is a defective Power MOSFET . It has a short circuit. Test: In the "MAX" position, the fan runs slightly faster than in the control range. This is due to the relay, which bridges the FETs at "MAX". To find the faulty FET, all FETs must be de-soldered and tested as shown in the appendix. With two fingers alternately 1 and 2 (ON) and 1 and 3 (OFF) are touched. It is BUZ71, BUZ11 can also be used. So this error variant can occur on the heater sword too. Last edited by shogun; 09-22-2018 at 07:30 AM. comment by demetk: The sword can fail without notice. On my failed sword I replaced the transistors but it still would not power the blower motor. Upon closer examination of the curcuit board I found and fixed some solder joint failures and it finally worked again. You can test for power to blower motor at the sword or at the blower motor. If you have power then suspect the blower motor. I usually apply 12 volts to the blower motor to test if it works. Last edited by shogun; 02-06-2019 at 07:44 PM.